Yesterday I saw a post on the Official Google Blog about making your own search story videos in minutes. The post announced Google's simple to use search story video creation tool. Google introduced these search stories during the Superbowl with this ad, Parisian Love. All you have to do is type in your searches, pick your music and transfer it over to Youtube. Try it out here. I thought I would test out the tool by creating a quick sample video marketing my health care legal practice featuring my Health Care Law Blog. Also thinking about how marketing staffs for physicians, hospitals and health care organizations might creatively use this tool to create great marketing and public informational pieces. For example, a search story that reminds people to do a self examination, promotes a public service announcement, recommend certain preventative health measures or make healthier micro decisions. NCAA Final Four: It's a great day to be a Mountaineer wherever you may be! Today the WVU Mountaineers take on the Duke Blue Devils in the NCAA Final Four. Good luck to the Mountaineers as they try to move on to the Championship Game on Monday night against the winner of the Bulter vs. Michigan State contest. West Virginians everywhere are excited about the game and proud of the hard work and dedication put in by the Mountaineer players, coaches and staff. It is a great day to be a Mountaineer! All week it has been exciting to watch the buzz and excitement grow throughout the state. 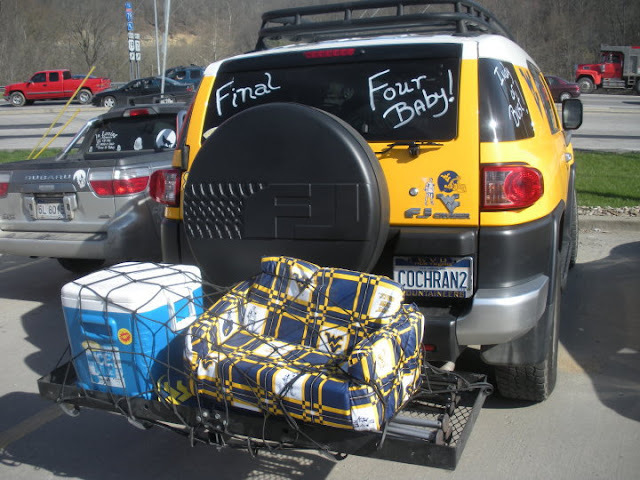 I loved this picture of some Mountaineers leaving Morgantown headed to Indianapolis with their cooler and couch strapped to back. I had to share it with everyone. Thanks to Lisa Simmons for the photo. You have to be a Mountaineer to understand the couch burning tradition (some history on the tradition and one of my favorite videos below).